In the first of far too many flashbacks this evening, Blue reassures Charming and Snow that their daughter will be the Savior and everything will be peachy. For two people who also spout this kind of gushy optimism, they are unfairly grouchy about the fairy’s blanket optimism. However it does give Charming the chance to speak the episode’s tagline: Happy endings aren’t always what we expect. In Gold’s shop, Snow reminisces with Emma over her old mobile. The two bond further over having both tried to do what was best for their kid by sending them away. In more important news, Rumple is nearly ready to perform the switchback spell as soon as he gets the Black Fairy’s wand. Tink, Neal, Hook and Charming are working on that at the church, where the Blue Fairy’s body is laid out for mourners. Looking to pay his respects, the Shadow swoops in upon the Wand Retrieval Unit. Commercial. Neverland, a long time ago. Hook and Smee trudge through the forest looking for a way off the island but they don’t get far before Smee is knocked out. The culprit snags Hook too with a hand in his hair and a dagger to his throat. But Tink loses the upper hand immediately when the pirate turns up the sexual tension with his husky voice and piercing eyes and that accent… Um, anyway. Once he’s determined she’s barely a threat and even less helpful due to her lack of magic, Hook settles for sharing a swig of rum with the fairy. In the church, the pirate valiantly volunteers as bait and even though Neal is standing by coconut at the ready and they’re in a Catholic church where lit candles are a-plenty, Tink has to use the last bit of pixie dust in existence to light the coconut. She’s able to then fly up, capture the Shadow and toss the coconut in a nearby fire to extinguish him/it forever. I’m sorry, it was that easy this whole time?! Why do I feel like to truly enjoy this show all the time, you need to be kind of stupid or at least ready to accept any kind of B.S. thrown your way? Example: the Blue Fairy is alive! That big emotional punch from last week when a fan favorite character was unexpectedly offed? Yep, that’s all been completely neutralized. Blue is helpfully able to produce the Black Fairy’s wand and even offers to give Tink her wings back. Because he’s a guy who thinks of everything, Rumple puts Greg and Tamara’s Mysterious Cuff of Magical Blocking on Henry/Pan’s wrist. That way the sneaky boy won’t be able to use his powers once back in his body. Then, with a wave of the wand, Rumple swaps the boys back. While everyone else leaves to find Henry, he stays behind alone to chat with his papa once he wakes. This seems like a terrible idea. Commercial. In the present, things seem to be going swimmingly as Henry runs into his mothers’ arms and hands over the scroll. When Regina takes it though, she collapses. Meanwhile, Rumple and Pan have a nastily poignant chat. Pan accuses Rumple of taking his money and destroying his dreams by simply existing. It’s a level of hatred that even the Dark One never elevated to and it’s proof once more that Rumple’s strength and weakness has always been in that he has a heart. This is a good thing, although some additional brains might’ve been helpful because then he could’ve thought through the whole magical-blocking cuff. See, Pan made that cuff so it doesn’t work on him but it does on his son. Powerless, Rumple is chucked across the room by his papa and then kicked for good measure. Pan promises to kill everyone Rumple loves just because Pan knows it’ll hurt his son. Then he saunters off while the Dark One desperately tries to remove the cuff. Commercial. Flashback. In the Dark Castle, Belle stumbles upon Rumple lighting a candle in memory of his son. She sweetly offers her condolences and he opens up to her: Today would’ve been Bae’s birthday. He misses his son and hopes to find him someday to apologize. In his shop, Rumple is still trying to remove the cuff but eventually gives up in favor of his sword. He’s been watching Merle on The Walking Dead, hasn’t he? Outside, Pan freezes the whole cast and monologues about who to kill first. But Rumple, still with two hands and no magic, pops up to stop him. Just as the son doubted his father’s cunning and power, so Pan has mistaken Rumple’s love for Bae and Belle. The Dark One is ready to sacrifice himself to save them (and everyone else). He calls his shadow to him and his dagger along with it. Rumple grabs his father in a tight embrace and stabs him in the back. Even when his Papa reverts back to his middle-aged form and pleads that they can start a life together again, Rumple just twists the knife deeper. “I’m a villain and villains don’t get happy endings,” he sneers. Then they’re gone in a flash of light. Belle crumples to the ground in tears and at home on my couch, I start to tear up as well. Commercial. Everyone is still shocked by Rumple’s sudden and apparent death when Grumpy, fulfilling his only job in this story, comes running in shouting his trademark, “It’s here!” Pan’s curse rushes towards the town and Regina finally tells everyone that she knows the price she/they have to pay: Storybrooke will disappear and everyone will be transported home. Only Henry and Emma will stay behind because he was born there and Emma’s the Savior. Also because we already did the storyline about how Henry was going to be left in Storybrooke alone. The kicker this time is no one will ever be able to return from the Enchanted Forest. They’ll be separated forever. Commercial. Eleven years ago, Emma still gives birth to Henry while in prison. She still doesn’t want to see or hold the baby and still thinks she can’t be a mother. In the present, she and her son say tearful goodbyes to everyone at the town line. Henry tells Regina he feels responsible for what’s happening because he went to get Emma three years ago. Um, how about more recently when you were a complete dupe and gave Pan your heart? Emma hugs Neal in farewell but shares a hearted moment with Hook, who promises, “There’s not a day that’ll go by that I won’t think of you.” Just kiss him already! As if being separated from her family wasn’t already enough, Regina crushes Emma’s soul just a bit more by telling her that even her memories of the past few years will vanish. As consolation, the Queen offers Emma a gift of happy, albeit false, memories instead. Emma and Henry get in her yellow bug as drive away as Regina rips the scrolls and destroys Pan’s curse with her Force lightning powers. The town vanishes in multicolored smoke and the town line along with it. In a flashback, Emma changes her mind about holding newborn Henry. One year later, mom and son are living happily in the city, enjoying breakfast and cinnamon sprinkled hot chocolate. 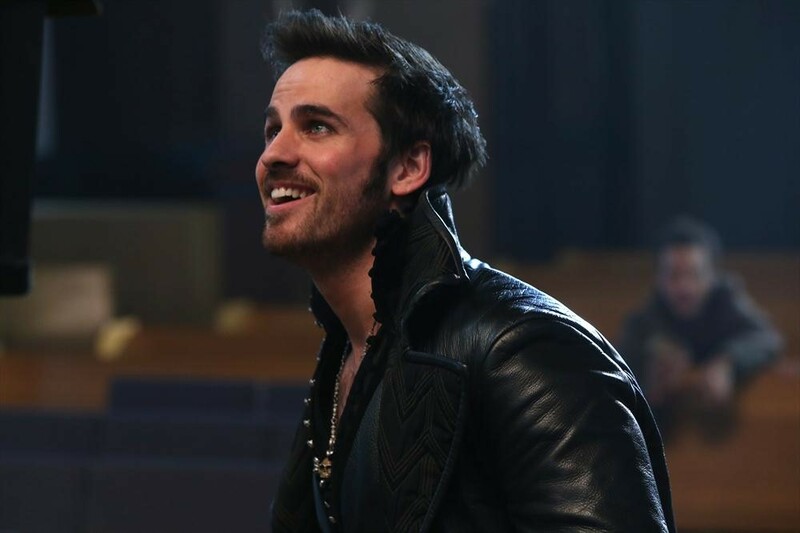 An unexpected knock at the door reveals…Hook!! The pirate is overjoyed to have found Emma but his attempt to kiss her into remembering everything earns him a knee to the groin and a door in the face. The Shadow is stalled in his/its attack at the church because it apparently can’t phase through a window. Regina to Hook, referring to when he helped Greg and Tamara kidnap and torture her: “I haven’t forgotten about all that by the way.” Heh. Robbie Kay as Pan (and as Henry in Pan’s body) has been so impressive this whole season it’s an incredible shame to see him leave. I can’t wait to see him pop up in everything else. Why is there time for every character to have their special monologue moment before Pan’s curse hits? Rumple speaks his final words to the two people he cares about most: “I love you Bae and I love you Belle. You made me stronger.” I suddenly find I have something in my eye. Belle is naturally the only one actually crying after Rumple’s death but Regina, and not Neal, is surprisingly the second most emotional. Regina’s confession that all she’s ever wanted from Emma was for blondie to get the hell out town so Regina could live happily ever after with Henry was spot on. Her concession that what’s more important to her now is that Henry be happy was perfect. Regina urges Emma to leave with Henry before the Queen breaks the curse. Where is Emma going again? Isn’t the curse coming from all sides and there’s no escape? If Blue was revived when the Shadow died, doesn’t that mean that Owen is alive on Neverland? This would make sense but I truly hope I’m wrong or that Once ignores this bit of continuity because I would hate to have to deal with that whiney guy again. Compared to past cliffhangers in Once history, I’d say this mid-season finale ranks just above Henry being kidnapped but far below Rumple bringing back magic. The preview for Once’s return in March reveals a new villain: The Wicked Witch from Oz. Is anyone else disappointed it wasn’t Cruella de Vil?